The findings were published in the Proceedings of the National Academy of Sciences and highlighted for their breakthrough in the long search for silk with such mechanical properties. The manuscript was published after an in-depth peer review process, and was deemed by the publishers as a newsworthy article of the issue in which it appears, further indicating its relative importance to science and technology. “It’s something nobody has done before,” Fraser says. 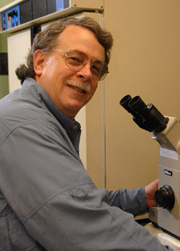 The project, which used Fraser’s piggyBac vectors to create transgenic silkworms with both silkworm and spider silk proteins, was a collaboration of his laboratory with Donald Jarvis and Randolph Lewis at the University of Wyoming. Jarvis’ lab made the transgene plasmids, while Fraser’s lab made the transgenic silkworms and Lewis’ lab analyzed the fiber from the silkworms. 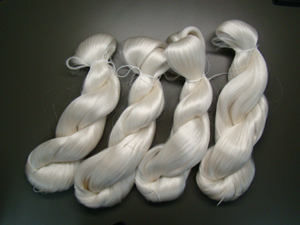 Results showed that the fibers were tougher than typical silkworm silk and as tough as dragline silk fibers produced by spiders, demonstrating that silkworms can be engineered to produce such improved fibers. Commercial production of spider silk from spiders is impractical because spiders are too cannibalistic and territorial for farming. Researchers have experimented with producing the stronger material in other organisms, including bacteria, insects, mammals and plants, but those proteins require mechanical spinning – a task the silkworms perform naturally. The stronger fiber could find application in sutures, where some natural silkworm silk is used, as well as wound dressings, artificial ligaments, tendons, tissue scaffolds, microcapsules, cosmetics and textiles. This work is the culmination of a research effort begun more than 10 years ago with an internal award from Notre Dame to Fraser to develop silkworm transgenics capabilities; a two-year NIH R21 grant awarded to Jarvis, Lewis and Fraser; and several years of supplemental funding from Kraig BioCraft Laboratories. 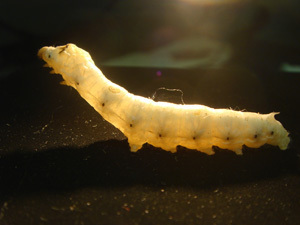 The success of this research would have been impossible without the ability to carry out silkworm transgenesis, mastered by Bong-hee Sohn and Young-soo Kim in the Fraser lab at Notre Dame. Kraig Biocraft Laboratories Inc., with Fraser, Lewis and Jarvis on its scientific board, is currently evaluating several business opportunities for this first generation fiber for both textile and non-textile use. The researchers ultimately expect to improve on the first-generation product to make even stronger fibers. Fraser is the Rev. Julius A. Nieuwland, C.S.C., Professor of Biological Sciences at Notre Dame and is a member of the Eck Institute for Global Health. Fraser holds seven patents and is widely known for his work in molecular virology and transgenic engineering.